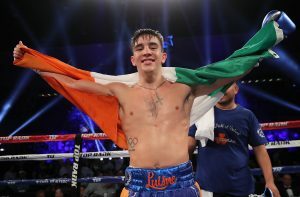 MICHAEL CONLAN made a sensational homecoming at the SSE Arena in Belfast last night as he boxed in his home country for the first time in some eight years – Adeilson dos Santos was the chosen opponent and Conlan was aware that even as the overwhelming favourite, he still had everything to prove. Dos Santos, presumably, viewed this as his opportunity for a route straight back to the world title scene – having contended for Jessie Magdaleno’s Super Bantamweight crown last year – and came out with a high-tempo, something that Conlan predicted pre-fight. A raucous atmosphere cheered on their homecoming hero and dos Santos started the bout rather oddly, crouching a couple of times in the middle of the ring, before setting about his fight rhythm in the centre of the ring but Conlan remained calm. After all, this was expected. Conlan was scamperous with his footwork, bouncing from foot to foot and keeping his staunch guard. Firing in a few jabs in order to test the range, Conlan managed to evade the guard of dos Santos on a couple of occasions. Switching stances periodically it was clear that Conlan was going to be the silkier of fighters and with the Belfast-icon finding his comfort zone early on it began to look like a long night for his Brazilian opponent. A leaning, leading, right hand set up the left hand to the body from Conlan and whilst the occasional big left hand managed to miss the target, the busy work was being done to perfection and keeping Adeilson at bay. Patience was the name of the game as Conlan returned to southpaw for the third round and dos Santos looked to get on the front foot, seeking out pockets of activity in which to launch an attack but Mick Conlan’s superior movement saw him evade near-all of dos Santos’ shots. The Brazilian began to get frustrated as Conlan’s fight-intelligence came to the fore with the constant stance-switching and ramrod jab causing real problems for the former world title challenger. At one point you thought dos Santos may start to have success against the ropes with a series of shots but, before you knew it, Conlan had slipped off the ropes and launched an attack of his own. A display of technical brilliance as opposed to any ego-boosting needless aggression, Conlan was making dos Santos pay whilst remaining in first gear. Body feints from Conlan were all that was needed to throw his counterpart off the scent and the shoulder shimmy started to become a work of art, frustrating dos Santos whilst creating the opportunity for a 1,2,3 of Conlan’s very own. An accidental cut to the head of Conlan made no difference as the relaxed Irishman simply upped the levels of frustration being felt by dos Santos, firmly in control, picking apart the Brazilian with ease without the need for reckless punches. Conlan started to develop a neat counter punch which he landed with considerable success as we went into the second half of this, scheduled, eight rounder but the sixth round produced some real success for Adeilson dos Santos who used his reach advantage well to control portions from distance before slipping in up close and landing shots to the inside of the Irishman. Success but nothing game-changing and, certainly, nothing that Michael couldn’t handle. A tough cookie that refused to crumble, dos Santos was probably the ideal opponent for Conlan in that whilst there was no major threat to Conlan’s unbeaten record, he probably learnt a hell of a lot more in this fight than in all of his previous bouts put together. Conlan had to think but he didn’t have to test himself, this was a display of technical precision from a relaxed fighter who, without doubt, looks the real deal. On the undercard featured the most bitter of rivalries between Jono Carroll and Declan Geraghty, a contest for the Carroll’s IBF Inter-Continental Super Featherweight belt, and the tempestuous duo opened up with a tantalizing pace, Carroll the busier of the fighters but Geraghty causing the damage, cutting Carroll above the right eye and, indeed, on the bridge of the nose. Into the second round of the bout we went with both men taking to the centre of the ring, landing at a furious pace, Geraghty appeared to be having the better of the exchanges, leaping from distance into the body of Carroll in order to earn the plaudits of the crowds. As the round continued, however, Carroll worked into his natural game, bringing the aggression and refusing to lie down and have his belly tickled. Carroll began to prove why his record is an unbeaten one with an incredible pace tempo and, already, after a mere two rounds, Geraghty looked visibly fatigued and flustered when walking to his corner. Pre-fight Jono had accused Declan of lacking stamina and it began to emerge why with the challenger huffing and puffing just a minute into the third and Carroll kept the pressure up, throwing repeated punches into the body of Geraghty whenever there was a lapse in the guard of Geraghty. A barrage of sustained aggression with a minute left of the 3rd round saw Geraghty touch down, the legs of the fallen began to betray him, Carroll’s onslaught ever-hastening, but Pretty Boy, somehow, survived to see the end of the round. The attacks began to flow from Jono – who won the previous encounter between these two southpaws – but Geraghty chipped in each salvo with a timely reminder that he was still here to fight. If not with punches but with his elusive movement to duck and weave his way from the never-ending work-rate of his nemesis. Taking a significant time to return to the ring ahead of the fifth round, Geraghty was clearly struggling and the fight took a bit of a lull for that particular round with both men taking a breather but Carroll still remaining the busier fighter. This fight began to turn into a pure beatdown as we extended into the second half of the bout, Carroll launching attack after attack into the body of Declan Geraghty, sapping the energy out of the game challenger who, he claimed, was the pre-fight betting favourite. The seventh and eighth round was a familiar story with Jono Carroll keeping sustained pressure, with an evil smile on his face, varying shots from head to body but with a particular preference to the livers of Geraghty. By this point there was little doubt who would win. Somehow Geraghty made it to the ninth round offering precious little in terms of resistence and Bob Williams, the referee, informed Geraghty that if he didn’t witness more in defence then he would call the fight off. Bouncing around the ring, Carroll had the energy of a terrier spaniel, and looked set on finishing the job inside the distance, cutting the ring off and working on the inside of Geraghty – fighting up close and personal Geraghty fell to the ground, ruled a push, before a flurry of uppercuts from Jono Carroll saw his foe’s head bounce back and forth like a yo-yo, causing Williams to slide in and call the contest to a halt – a ninth round TKO for Jono Carroll in a case of repeat victory. To rattle through some of the other major results from Belfast, Jack Catterall emerged the victor in tough contest with Tyrone McKenna by score-lines of 95-91, 94-93, 94-93, in a contest that, whilst entertaining, taught us very little about either prospect; Tyrone McCullagh comfortably outclassed, Scottish champion, Joe Ham to claim the vacant Celtic Super Bantamweight title with the well-mannered man proving he’s as brutal in the ring as he is polite out of it; Johnny Coyle and Lewis Benson produced an absolute war of a fight to leave pundits and punters in turmoil as to who deserved to win but, officially, the verdict was for Johnny Coyle by a single round. Boxing and Belfast, it’s the perfect combination.